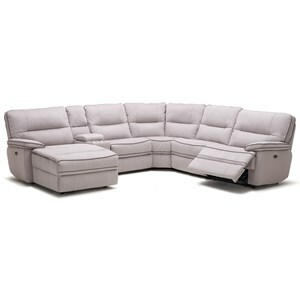 Each end of this sectional features a power recline seat for luxurious comfort. The seat on the other side of the center console with USB charging, cup holders, and storage compartment manually reclines with a hidden release. 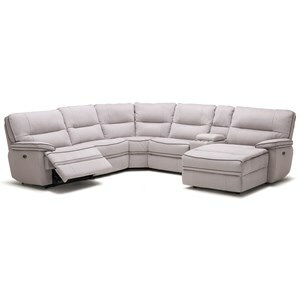 The two tone upholstery with accent stitching has a casual contemporary appeal for your living room decor. Console opening 8.75" x 12.00" x 3.50"
The Hacklesbury Two-Tone Reclining Sectional with Storage Console by Benchcraft at Beck's Furniture in the Sacramento, Rancho Cordova, Roseville, California area. Product availability may vary. Contact us for the most current availability on this product. 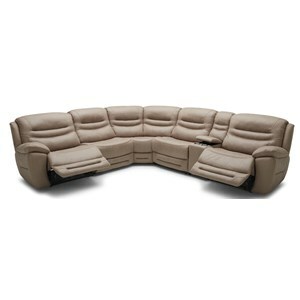 5550258 LAF Zero Wall Power Recliner 1 32" 42" 42"
5550290 RAF Double Recl Power Console Loveseat 1 69" 42" 42"
5550277 Wedge 1 72" 42" 42"
Shaped pillow arms and attached backs with channel tufting create a fresh casual contemporary look for your living space. Two faux leather fabrics also combine for a two-tone style. Power controls makes reclining as easy as pressing a button. The Hacklesbury collection is a great option if you are looking for Contemporary furniture in the Sacramento, Rancho Cordova, Roseville, California area. Browse other items in the Hacklesbury collection from Beck's Furniture in the Sacramento, Rancho Cordova, Roseville, California area.